Vintage Gyrator eq Tight eq with a sheen. Originally designed by N**e engineers in the late 70's early 80's. Rebuilt by Raw State. These units contain mariner transformers as found in Many N**e products. The name Gyrator eq comes from the actual main components used within the eq section, which are Gyrators, Gyrators were basically used to replace inductors. 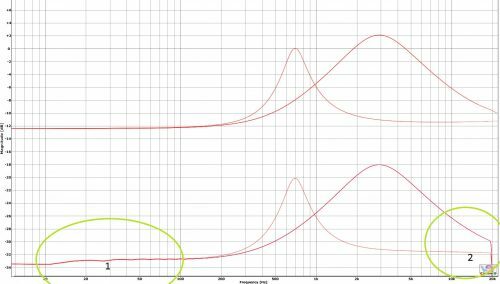 for demonstration purposes the band isolation can be seen in these graphs with two bell plots. The bottom plot is what you'd expect from a standard sampling. 1. This shows the problem of the overall characteristic, I actully left a little bit of truncation ringing in that version too, this is something I normally don't let happen anyway. The top plot shows we have dead flatness around the curves. Sucsessfully islolating the bell curves. 2.This shows a typical steep filter ocurring in many Ad/da causing a little bit of coloration on low sample rates, I believe coloration is due to ringing down through the impulse rather than hearing a cut off at dog ears land, . The top plot shows a more suitible low ringing filter. Note this is not the American company that exists today who make microphones..
Last edited by Tim Petherick on Tue Jun 27, 2017 3:17 pm, edited 13 times in total. Re: NEW RELEASE VIntage Gyrator eq with introductory price!! first 2 people to reply to this thread will get a free copy!! Did someone say free copy?! garrick wrote: Did someone say free copy?! nissy875 wrote: wow! I want it! Ohhh those lows, tight thunder! is this an "all bands in one instance" library. cps418 wrote: is this an "all bands in one instance" library. Not this one, the problem with doing that in this particular library is that there would be too many settings to capture. The dynamic capture and 4 sample rates made this quite a long sampling session. It took a few weeks to sample. Plus I needed to keep cpu low as possible. Hi Tim! great release I plan to buy it. when is the intro price over? does that mean the HPF are also sampled dynamicaly? is there a big difference when sampling eq dynamicaly? I'm looking for a very colorful eq. would you say so? last questions is they shelf in low and high? pleplo wrote: Hi Tim! great release I plan to buy it. when is the intro price over? Hpf is dynamic yes. The Low and High are actually Bell. This means very tight low boost. Not combo high and low like the other library's, It was to hard to do like that this time.